The Kahibah Sports Cannons Minor Premiers have added the Major Premiership to their dominating season in the Tony Tamplin Shield. Belmont 16′ Sailing Club No.2 battled well to reach the Grand Final after just scraping in to 8th spot in the finals but Kahibah stopped their impressive run. On the night Kahibah flew out of the blocks with a couple of quick wins before the Belmont attempted to fight their way back into the match. However, Kahibah’s momentum was too great and they ended up winning the night in a comprehensive fashion. A big thank you to Wangi Workers Club for hosting the Grand Final, Ian Callaghan and Grant Schubert for refereeing on the night and Chris Mungoven and Annette Clifford for excellent running the 2018 Tony Tamplin Shield and also ensuring the Grand Final ran extremely smoothly. Rob Elsley took out the season high break with a 61. Anyone who wants to watch table 2 of the Grand Final can watch here. The Kahibah Sports Canon defeated Mayfield Bowling No.2 three games to two and Belmont 16′ Sailing Club No.2 beat Wangi Workers Club, also three games to two, to progress to the 2018 Tony Tamplin Grand Final. The Grand Final will be held at Wangi Workers Club 6:30pm on the 7th of November and spectators most welcome. For those who can’t make it, one table will be streamed, which can be accessed by searching “newcastle snooker” on YouTube or by visiting www.facebook.com/NDBSA. Good luck to both teams. Mayfield Bowling Club No.2 and Belmont 16′ Sailing Club No.2 beat their compatriots (Mayfield No.1 & Belmont No.1) to progress to the preliminary finals match and will face Wangi Workers Club and Kahibah Sports Cannons respectively. Both matches will see who progresses to the 2018 Tony Tamplin Grand Final. Good luck to all teams involved. Week one saw the Minor Premiers Kahibah Sport Canons and 2nd place Wangi Workers Club progress to the preliminary final of the Tony Tamplin Shield. Belmont 16′ Sailing Club No.2 and Mayfield Bowling Club No.2 also progressed and will play the compatriots Belmont 16′ Sailing Club No.1 and Mayfield Bowling Club No.1 respectively in the semi-finals. Good luck to all teams. Congratulations to the Kahibah Sports Canons who showed their class by taking out the 2018 Tony Tamplin Minor Premiership. The Cannons are on an unprecedented winning streak of 17 consecutive matches not having lost a match since the 16th of May. Please find the draw below for the make-up of the finals. Home teams remember that you need to provide markers for all your matches. Good luck to all teams on the finals. The order of play for the finals will be draw out of the hat and each match goes on as soon as any table becomes available just as in the group stages. As always home teams get the right to choose which tables the first 2 (or 3 for 3 table venues) home side players play on. Home teams mark matches except when it’s a 3 table venue and in that instance the away player/s not playing should assist with marking. The NDBSA is continuing to have trouble with player’s implementation of the foul and miss rule in the Tony Tamplin Shield. After looking at what other Associations are doing the Committee has come up with, what we believe, is the best amendment that will take out all subjectivity and result in a consistent adaptation that will limit the ongoing problems with how this rule is implemented. 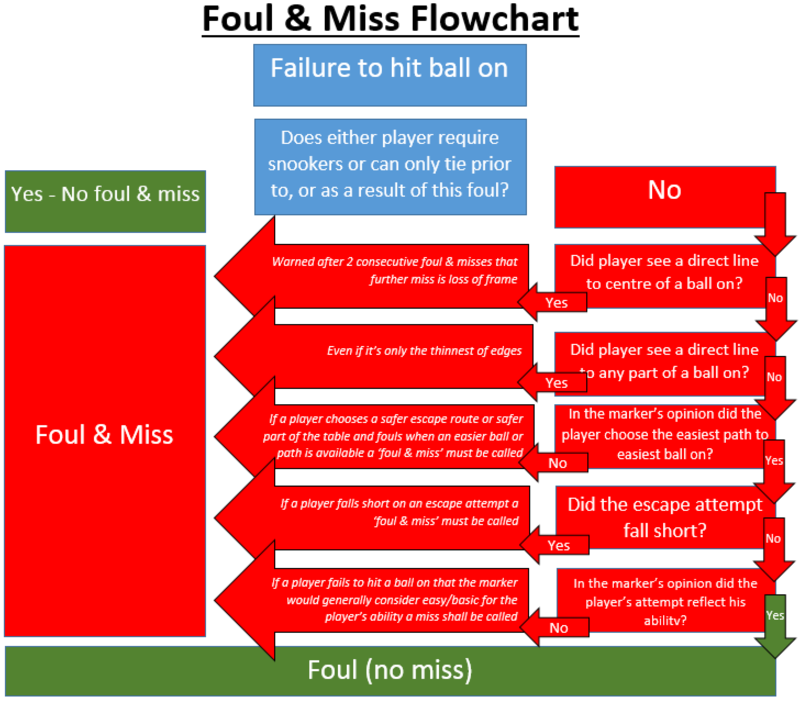 Any failure to hit the ball on will result in a “foul and miss call”. As in the WPBSA Rules the opponent will have the choice to 1/ Play from where the balls lie, 2/ send his/her opponent back in, 3/ Ask for the balls to be replaced. A subsequent failure to hit the ball on will also result in a foul and miss. If there is a clear path to the centre of ball on is available then the player will be warned that failure to hit the ball on at the third attempt will result in loss of frame. If there is only a partial part of a ball on or they are snookered the player, on his or her third attempt must play hard enough to reach the ball on and if they fail to hit the ‘ball on’ at their third attempt then only a foul will be called. As per usual if snookers are required prior, or as a result, of the foul, no miss will be called. After four (4) weeks trial, Tony Tamplin captains will be able to provide input about whether they would like this rule variation will continue for the rest of the Tony Tamplin Shield.